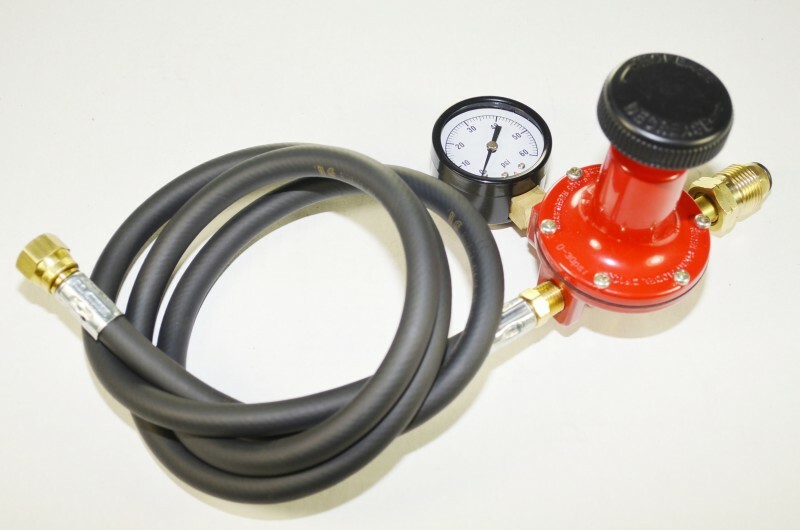 COMRI-30 -ADJUSTABLE 0-30 psi High Pressure Regulator and Pressure Gauge Assembly, includes a POL propane tank fitting, a pressure gauge, and 1/4 ID UL approved hose. ► Red Acme wrench-less safety tank connector is available at the top of this page, at an additional charge. ► Stainless Steel protective hose overbraidis available as the SS Hose purchase option at an additional charge. ► QDC High Pressure Quick Disconnect Hose Combination Set is available as the QDC Hose Set or theStainless Steel Overbraid Quick Disconnect hose as the QDC-SS Hose Set purchase Option. Wt. 3# (w/ 5 ft hose). Free shipping within the 48 contiguous U.S. States.